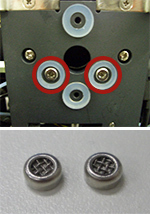 Main accessories for On-chip Flow (cell analyzer) / On-chip Sort (cell sorter) are as blow. The chip holder is a holder for keeping the microfluidic chip in place inside the instrument. 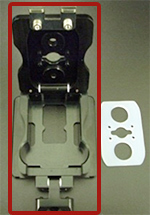 This is packing to set up inside of the lid of the chip holder, to seal up the pressure of the liquid to send from the main body of device. This is a filter for pressure control units. This prevents that garbage invades the plumbing in the device. 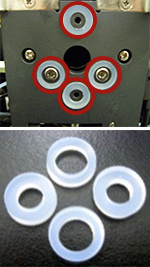 This is packing to prevent an escape of pressure between Pressure-control unit and Chip holder .